Golden Jungle slot machine is a game from IGT that takes us off to the jungle’s of India, and it has 5 reels, 50 paylines and a max jackpot of 2,000x. The mobile slot captures the subject matter brilliantly, and has two main bonus features. The first feature is called Wild Stays 4 Plays, which as the name suggests means that any wild symbols stay on the reels for 4 spins, and the second is a huge free spins round with up to 75 free spins. Keep reading below for all the details in the Golden Jungle slot review. Take a trip to the steamy wilds of the Indian subcontinent in the Golden Jungle slot, a five-reel, 50-payline game from IGT slots that includes an incredibly lucrative free spins feature and all manner of gold-plated rewards. Set to a backdrop of lush foliage and ancient brickwork, the Golden Jungle slot machine is beautifully designed slot that stars a majestic tiger on its reels. This special stacked symbol is supported by a range of equally unique icons, including turbans, golden elephants, ornate boxes, ceremonial daggers and several pieces of expensive-looking jewellery, which helps to create a consistently immersive atmosphere throughout. 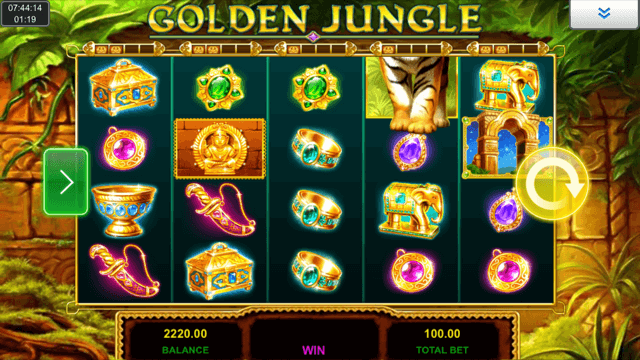 Playable from as little as £0.50 per spin with all paylines active, Golden Jungle can be enjoyed across all desktop, mobile and tablet devices and features a fairly hefty base game jackpot of 2,000x players’ bet per line amount. This maximum award is triggered by landing the tiger symbol across a valid payline on all five reels, and this can be more easily achieved with the help of the slot’s bonus features. For starters, players will notice that above each of the game’s five reels, there’s a little golden bar with four empty spaces. Whenever they land a golden statue symbol anywhere in view, it will fill up one empty space on its respective reel. Once all four spaces have been filled on a reel, the entire column will become completely wild and will remain that way for the next three spins, creating further wins. Wild reels also play a major role in Golden Jungle’s main feature too. This game is triggered whenever players land three or more golden arch scatter symbols anywhere on the gameboard – and like in other IGT slots, when it does come around, players will be able to choose from a selection of options. Essentially, they’ll be able to balance the number of free spins they receive against the number of reels that are wild, with 2-75 bonus games up for grabs and one, two or three wild reels also available. A great looking game with consistently rewarding payouts, the Golden Jungle slot is another IGT game that effectively puts players in control of its variance by letting them customise its main bonus feature. Like the Golden Jungle slot review? Check out these as well…..